January 23, 2010 - The Finnish Border Guard has ordered a fourth AgustaWestland AW119Ke single engine helicopter. The Finnish Border Guard chose the AW119Ke in 2008 to sustain its fleet modernization and enhancement program. All four helicopters will be used to perform various tasks including border patrol, special operations and fire fighting. The Finnish Border Guard is the national security agency responsible for enforcing the security of Finland's borders. It is a military organization, subordinate to the Ministry of the Interior in administrative issues and to the President of the Republic in issues pertaining to the president's authority as Commander-in-Chief. The border guard's personnel consist of 3,600 men and women, including 500 conscripts who are not used for border control during peace time. The mobilized strength of the Border Guard is 11,600 persons. The first three helicopters ordered will enter service during the 3rd quarter of 2010 and will operate from Helsinki and Rovaniemi (Arctic Circle) bases, flying in the harshest environmental and weather conditions and covering the entire Finnish/Russian border. The Finnish Border Guard will also be provided with a tailored training and support package as part of the contract. The original order for three aircraft marked the entrance of AgustaWestland's AW119Ke helicopter into the European law enforcement and homeland security helicopter market. This purchase continues and strengthens the longstanding relationship between AgustaWestland and the Finnish Border Guard who has been supplied with AB206 JetRanger and AB412 helicopters. The Finnish Border Guard’s AW119Ke helicopters will be fitted with dedicated tactical equipment and certified to perform missions using Night Vision Goggles (NVGs). 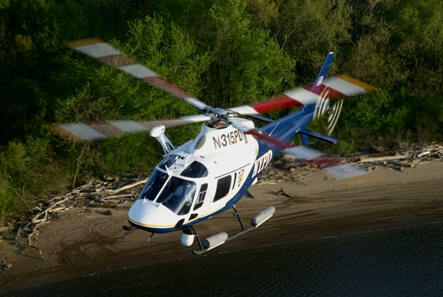 The AW119Ke's law enforcement and homeland security variant has a patrol time of approximately 5 hours and also has the largest cabin in its class which can be quickly reconfigured for different missions. The AW119Ke also delivers outstanding performance whilst having low operating costs. The Finnish Border Guard adds to a large number of leading customers who are operating or have chosen this helicopter type for homeland security and public service applications in several countries including the United States, Mexico, China, Republic of Korea, Spain and Uganda. Approximately 190 helicopters have been ordered to date by over 90 customers in 30 countries to perform roles such as law enforcement, EMS, VIP/corporate transport, offshore transport and fire fighting. The Finnish Border Guard is responsible for Finland's internal security, reporting to the Ministry of the Interior. The main functions of the Border Guard are guarding Finland's land borders and territorial waters, carrying out passport control at border crossing points, ports and airports, as well as law enforcement, maritime safety and performing search and rescue operations, especially at sea.